This one has been sitting around in my drafts folder for a while. I had forgotten about posting it until Scorpio Woman asked on Twitter about yummy things to dress up quinoa. Ever since Winco came to Utah, we’ve been able to easily (and cheaply) get all these fun grains to try. Quinoa, though it can be pricier than some of the other grains we eat, is delicious. As with rice, I cook it in my rice cooker for a quick and easy dinner component — we don’t often eat quinoa plain, but almost always with lots of additions or as part of something like a salad or tabbouleh. Cook quinoa in a rice cooker with veggie stock until done. Heidi at 101Cookbooks notes to cook it on the stovetop, simply bring the stock to a boil, add the quinoa then reduce to a simmer. Cook for 15 minutes or until the curlique in the grains is visible, remove from heat and strain if necessary. Blanch the broccoli in a pot of boiling water for one minute, remove with a spider. Transfer to a colander or sieve and run cold water over it to stop it from cooking. Process 2 cups of cooked broccoli pieces, garlic, half of the walnuts, cheese, salt, red pepper flakes and lemon juice until finely chopped. 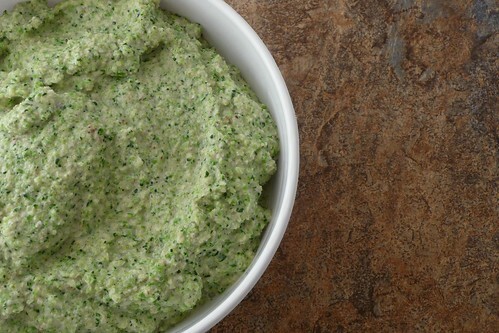 Slowly pour in oil and cream while the machine is running until the pesto comes together into a smooth, creamy mass. 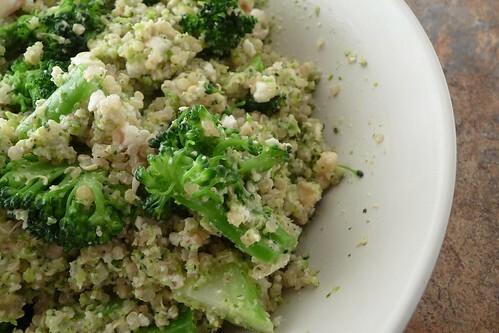 Toss quinoa and remaining broccoli with about 1/4 to 1/3rd of the pesto. Crumble the chevre and sprinkle it and the remaining walnuts over the quinoa. Toss everything together, taste and adjust quantities as needed. For those that are dairy-free, you should be able to easily substitute soy, rice or nut milks for the cream and omit the Parmesan. This entry was posted in american, dairy-free, gluten-free, italian, recipes, salad, sauce, untranslated, vegetable, vegetarian. Bookmark the permalink. I’ll probably double the red pepper flakes next time and make sure I have fresh garlic in the house before I start, but this recipe is definitely a keeper!